If you like shrimp, you will love this recipe! Thanks, Josie! Absolutely delicious and perfect for a summer barbecue! Many thanks to Colleen Kennedy for sharing this recipe. 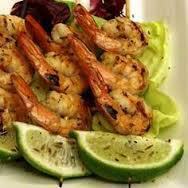 In a small bowl, combine garlic, oil, lime juice, tequila, salt, and red pepper; mix well. Add half the chopped parsley and toss well. Add the shrimp and marinate for 30-60 minutes in the refrigerator. Place the shrimp directly on your grill. Cook for 3 minutes on the first side and 2 minutes on the second side. Be certain they’re pink and cooked through. Enjoy with a green salad, fresh bread, and corn on the cob!